he Mortimers were descended from Roger de Mortemer of Mortemer-sur-Eaulane in Normandy, a supporter of William the Conqueror. Their main castle was at Wigmore, eight miles west of Ludlow. They had lands mainly in Herefordshire and Shropshire, including Cleobury (Mortimer) on the edge of the hunting forest of Wyre. By marriage to Joanna de Geneville, a later Roger Mortimer (1287-1330) secured possession of Ludlow Castle. This became the family's principal power base for the next six generations. 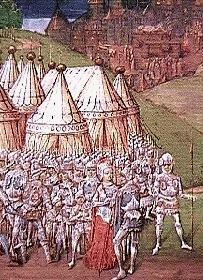 Roger Mortimer was a very powerful and ambitious Marcher Lord. He was the first of several members of his family to attempt to seize the throne of England. He fought the Scottish Wars and made attempts to remove the King's favorites, at first with some success. In 1323 he was imprisoned in the Tower of London, but escaped to France, an event he later commemorated by building St Peter's chapel in the outer bailey of Ludlow Castle. In France, Mortimer formed an alliance with Queen Isabella, who had deserted her effeminate husband, King Edward II of England. They raised an army, invaded England and forced Edward to abdicate in favor of his youngest son, the future Edward III. Mortimer entertained Isabella at his castles on the Welsh borders and they became famous lovers. Meanwhile, Edward II was cruelly murdered at Berkeley Castle in 1327. Following Edward's death, Mortimer, acting as regent, was the virtual ruler of England, but he over-reached himself and aroused the anger of other barons. In October 1330 he was arrested at Nottingham and sentenced to death. He was executed at Tyburn in London. Later, the ambitions of the Mortimers became part of the great dynastic struggles of the mid-15th century which became known as the "War of the Roses."